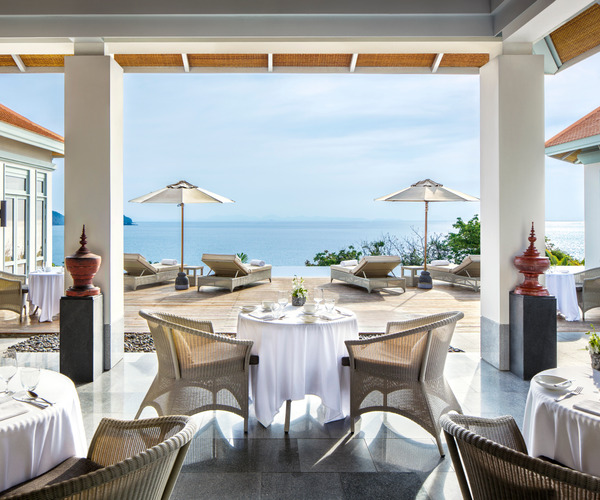 Nestled in a peaceful corner of Cape Pawna, Amatara Wellness Resort is Phuket’s relaxing island refuge. Although the resort is situated just 15 minutes away from town and a half-hour from Patong Beach, once you enter this tropical paradise, it will be difficult to find even one reason to leave. Southeast Asia’s premier, award-winning Thai spa and wellness retreat is settled on pristine, clear waters and offers guests a plethora of both relaxation and leisure options. The property is surrounded by local and cultural attractions and enchanting natural rain forests, while stays are enhanced by gorgeous seascape views. A visit to Amatara Wellness Resorts amplifies the senses, while simultaneously enriching mind, body and spirit. If it is a spa indulgence you seek, journey through necessary treatments with a pit stop at the Thai Hammam. Fitness enthusiasts can take advantage of yoga and Pilates, along with non-motorized watersports or Thai fitness class like Mauy Thai. Once externally at peace with the breathtaking Phuket surroundings, a visit to the spa will improve the inner you. Deriving its name from “amata,” which refers to immortality, and the endlessness associated with the passage of time, the Amatara mantra encourages you to lose yourself, while finding your way on your very own Thai voyage. A holistic approach combined with tranquil surroundings ensures your visit is both eventful and meaningful. Five signature wellness retreats are available, and focus on detoxification, weigh management, relaxation/pampering, bonding/reconnection and strength/endurance enhancement. A stopover at the Thai Hammam is renewal in its entirety. Designed in stages, exfoliation, massage, therapy and relaxation are achieved with the use of natural products and elements, along with contrasting temperatures and environments. Ranging from rain showers to thermal mud treatments and Himalayan salt cave therapies to Moroccan Black Soap massages, this path is both unique and revitalizing. Still, a collection of physiotherapies, holistic treatments and physical excursions awaits. Start each day with Amatara’s watersport adventures, thanks to complimentary access to paddleboards and kayaks, for your convenience, or serve up a round of tennis – equipment included. In addition, instructed, personal fitness activities are aplenty, and include everything from Muy Thai, Pilates and TRX to Kinesis, yoga and stretching sessions. Accompanied by the little ones? Chaperone them to the Kid’s Club, for a supervised day of action, including customized indoor activities, as well as outdoor pool fun. Children ages 4 through 12 are welcome from 8 a.m. to 8 p.m., allowing for copious adult time. For offsite exploration, Old Town features cafes, shops, shrines and temples. Learn more about limestone cliffs and the green-hued waters of Phan Nga Bay, while Phi Phi island hosts unforgettable scuba diving, snorkeling and boat tours, galore. Khao Phra Thaeo National Park is settled on the northernmost area of the island, hosting exotic flora and fauna on a scenic hike through Bang Pai, all the way to the Ton Sai Waterfall. 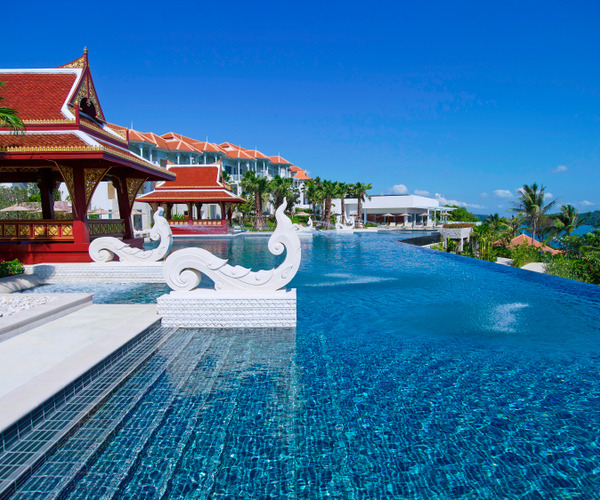 A blend of both pavilions and villas (105 total) offer tremendous views from any point on the property. Seven different room types cater to any and all preferences, and guarantee a luxurious and comfortable stay, despite the selection. No matter which room you choose, enjoy your very own private balcony with view of the sea (or even a private pool). Enjoy access to: free Wi-Fi, satellite TV, slippers and robes, mini bar, coffee facility, safe deposit box, musical device, air conditioning, 24-hour room service and twice-daily cleaning visits. Eight onsite food and beverage locations ensure you’ll always have delicious, healthy options, no matter what you crave. The Grill features delectable, fresh seafood and hearty meats, while The Restaurant serves traditional Thai and Asian cuisine all day long. Still, guests have the exciting opportunity to enrolling in Cooking Class, where a personal Thai Chef will teach you about the dishes of your choosing in a laid-back ambiance, followed by a relaxing afternoon tasting of your flavorful, local creations.